My 44th entry in Amy Johnson Crow’s “52 Ancestors in 52 Weeks family history blogging challenge. I am still playing catch up, from being sick much of this year. My 44th ancestor is my husband Jeff’s 2nd great grand uncle Walter Scott Gann (1875-1947). Walter was the youngest brother I have identified for Pauline Adeline Gann (1860-1938), my husband’s 2nd great grandmother. He was born 7 September 1875 in California to William Chamberlain Gann (1831-1893) and Elmira Tucker (1840-1920). Walter only recently came on my radar when Jeff and I visited the burial site of Jeff’s 2nd great grandmother Pauline and her husband Leonard Jackson Harless, who share a plot and headstone at the historic Mariposa District Cemetery in Mariposa (Mariposa County), California. We were there in July looking specifically for Pauline and Leonard’s headstone, but noticed a couple other Gann headstones located next to their grave site. I wasn’t sure who these Ganns were, just that they were likely related to us, so I snapped photos of the headstones. In doing a bit of follow up research for the names of those Gann headstones, I discovered that one of them was for Pauline’s brother Walter. Walter’s headstone is located just off of my husband’s left shoulder, behind and to the right of the headstone for Jeff’s 2nd great grandparents, Leonard and Pauline. (1880) 10th District, Calaveras County, California: 4 years old, living with his parents and siblings. (1910) White Rock, Mariposa County, California: 35 years old, worked as a copper miner, married to Gertrude E. (possibly a son name Joseph P.), living with sister Pauline and her husband Leonard. (1920) Lewis, Mariposa County, California: 45 years old, worked as a farmer on a stock farm, married now to Diana B., living next door to his sister Pauline and her husband Leonard. (1930) Township 5, Mariposa County, California: 55 years old, worked as a gold miner, divorced, living with his business partner. The only other real information I have on Walter is from his World War I draft registration card dated 12 September 1918. 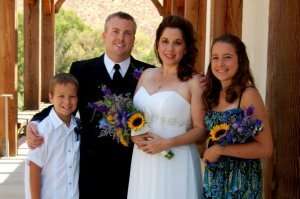 He registered in Madera, Madera County, California at 43 years of age. Walter lists a PO box in Lewis, Maricopa County, California as his last home address (his mother Elmira’s address), but identifies himself as a miner working for James H. Lestor in Raymond, Madera County, California. Gann is described with medium height, medium build, blue eyes, brown hair, and no physical disqualifications from service. 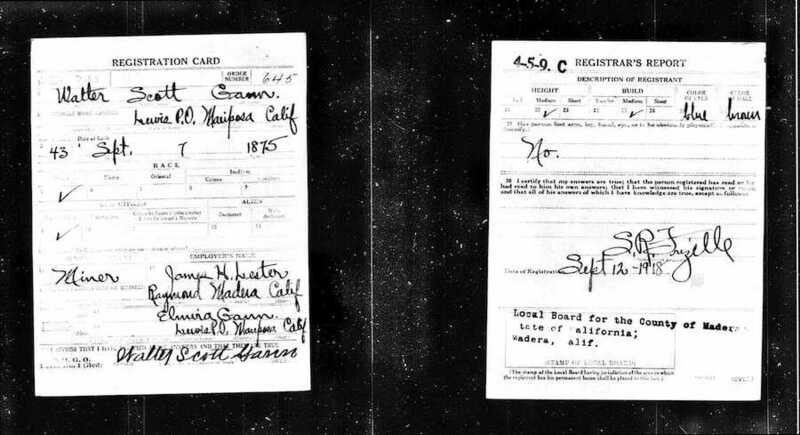 WWI Draft Registration Card. Courtesy of Ancestry.com. Click to view a larger image. Spouse: 1) Gertrude E., 2) Diana B.